Perhaps you hadn’t noticed, but I haven’t been posting much lately. This is mostly for positive reasons: fun and interesting social engagements, steadily progressing training runs in anticipation of a marathon in October, excellent meals eaten outside the home, all working together to spare you of my culinary musings. Related to the aforementioned activities or not, I’ve also been feeling a little blah about cooking lately. I’m still putting food on the table most nights, but it has mostly seemed pretty automatic — nothing quite interesting or delicious enough to share. I was uninspired. Inspiration, happily and frustratingly, comes at unexpected times. So it was this afternoon, in a moment of distraction from the tasks at hand, I allowed my RSS reader to direct me over to the latest post on our friend Brett’s blog Trout Caviar: Grilling the Market. Whether it was the picture of a beautifully charred carrot or Brett’s call for simplicity in summer preparations, something about his post got my wheels spinning again. My mind jumped immediately to dinner, where suddenly a pasta with some kind of onion, summer squash and cream sauce — most definitely blah food — started to take on a more interesting character. For one thing, pasta was out: no need for imported starch when a bowlful of market new potatoes sat underutilized on the counter. The summer’s first squash could still be used, accompanied by some of its first carrots. Given our current urban living situation, grilling was not a possibility; luckily, roasting can also develop those deeply browned surfaces I was after. A quick dressing with olive oil, vinegar, market parsley and garlic, and plenty of salt and pepper was all that was needed to showcase the best of the season. I read fifty to one hundred food-related blog posts in any given day; most of them are discarded with the spin of a scroll wheel. Sometimes though a post comes along like Brett’s that changes what I’m doing in the kitchen — and even my outlook on this blog. It’s enough to inspire someone to write a post. Cut the potatoes in half and place in large microwave-safe bowl. Microwave on high for 8 minutes, until starting to become tender. Toss potatoes — careful, they’re hot! — in ample quantities of olive oil, salt and pepper. Don’t wash the bowl just yet. 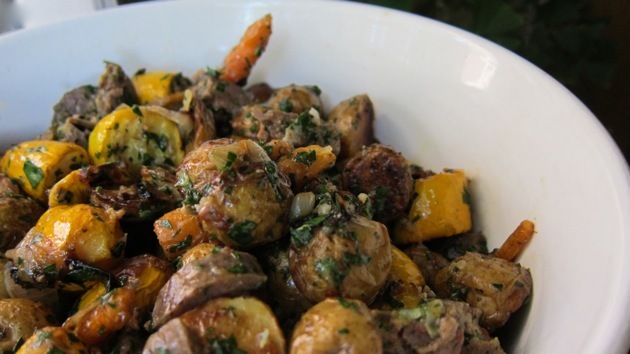 Arrange the potatoes on a sheet pan, cut-side down. Roast 20-30 minutes, until cut-sides are deep brown, just about to burn. Meanwhile, cut the squash into 1″ chunks and place them in the bowl you tossed the potatoes in. If your carrots are pencil thin like mine were, you won’t need to peel or cut them; thicker carrots can be quartered. Toss carrots and squash in bowl, adding more olive oil, salt and pepper as necessary to make everything good and moist and seasoned. 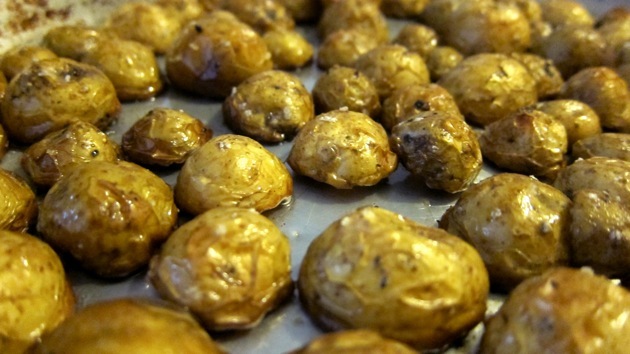 Turn the contents of the bowl out onto a sheet pan and roast in the oven 3o minutes, until the surfaces start to brown. It’s probably a good idea to flip these veggies around about halfway through the cooking so both sides get brown. Heat the butter over medium-low heat in a small skillet and add the onions. Cook until greatly reduced and deep brown. While the vegetables are roasting prepare the dressing by combining all the ingredients. Salt and pepper should be added to taste; given the quantity of vegetables, you may need more salt than expected. Add in the sausage (I used the beef, bleu cheese, and Surly Bender sausage from Clancey’s Meats & Fish). As the vegetables are done roasting/caramelizing, add them to the bowl with the dressing. When all is ready, toss the vegetables well. 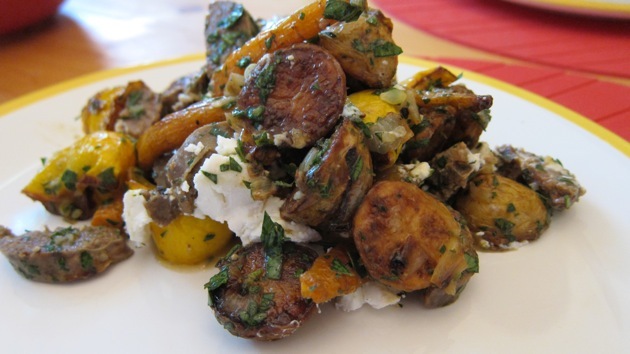 Top with crumbled goat cheese and serve. This entry was posted by Tom on Monday, June 28th, 2010 at 8:45 pm and is filed under Farmers Market, Food + Drink, Recipes. You can subscribe to responses to this entry via RSS. Tom: I’m honored, flattered, and very happy to be of service!